High in the Tibetan mountains, a man lies on the brink of death, injured and alone. As he slowly freezes, his attention wanders to the beauty surrounding him and images of a woman, only for these thoughts to be rudely interrupted by the arrival of another climber – his brother. As it turns out, the writer is fated to survive his ordeal, but cruelly, his brother will perish in his place. Reiste ich, lebte ich denn in seinem Schatten? war also mein Ziel? Eine Leerstelle? von dem was ich sehen und ich begreifen wollte? Was I travelling, living in his shadow? a smudge discovered on the internet my goal? A blank space? of what I wanted to see and understand? The Flying Mountain is also a novel of cultures and repression, both at sea level and at altitude. The brothers have grown up against a background of their father’s hatred of the English oppressors, with one scene showing his (rather ineffective) support for the IRA. From one colonist, we move swiftly to another, as the men see for themselves the results of Chinese rule over Tibet. As they travel across the vast expanses of land, they see the ruins of burnt-out temples, and there’s no need to look too far for victims of the majority rule as Nyema herself has suffered at Chinese hands. 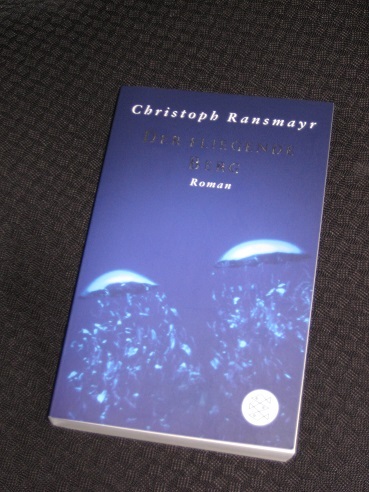 While the story is absorbing, the standout feature of the novel is the structure and its ‘fliegende Sätze’ (‘flying sentences’). The story is written in blank verse, and I’m sure I’m not the only reader to have been initially apprehensive at the prospect of 360 pages of what the writer unconvincingly denies is poetry. However, the book is actually fairly easy to read, with the narrative flow soon helping you to forget the unconventional style. In addition, these short sections encourage you to reread certain passages and help produce the epic feel of the novel (I suspect that the writing style also helps break up what could have been overwhelming in page upon page of prose…). It’s a wonderful read, but it could be argued that one slightly weak aspect to the novel is the inclusion of Nyema, the beautiful nomad who falls for the writer. A love interest certainly makes sense, but it all feels a little too convenient (and smacks of a Hollywood plot twist). There’s a sense here of exploiting the ‘exotic’, and Nyema comes across as a bit of fantasy figure rather than a fully-drawn character worthy of her place in the narrative. In truth, that’s a minor quibble, though, and it’s soon forgotten as we build up to the final climb. Even though we know what this last ascent will bring, we can’t help but will the brothers on, wanting them to make it to the summit, and hoping they find what they were looking for. In a strange way, despite the tragedy, these last chapters bring redemption to the two climbers as they manage to reconnect. In the end, perhaps, The Flying Mountain is less a book about conquering a mountain than of rediscovering what’s really important in life. I expect this to make the official cut, provided, of course, that Pare’s translation manages to capture the essence of Ransmayr’s work (the excerpt available here seems OK, even if there’s actually a bit missing towards the end!). It’s very different to the rest of the selections, with the possible exception of The White Book, and I suspect that the distinct nature of The Flying Mountain will see it move on to the final round. With the threat of altitude sickness looming, it’s probably for the best that we have to return to sea level. There are a couple more stops to make before the end of our journey, but – alas – time (not to mention my failure to source the final book yet…) has beaten us. The announcement of the official shortlist is almost upon us, so very soon we’ll know which of the longlisted titles remain to fight another day, and which have been kicked to the (metaphorical) kerb. Whatever the decision, rest assured that we in the Shadow Panel will have something to say about it – and will be making our own selection in due course. The fact that is it rooted in a real-story, albeit with a lot of details altered, and that Ransmayr himself has climbed extensively with the surviving brother gave me a lot of comfort that I was in safe hands (even if Pad wasn’t) in the climbing sections. The point re Nyema is well made – it didn’t bother me, but I think it should have. Maybe I will have to deduct another point! have to suffer from stress. Disturbing them will make it worse. How do I distinguish a dead hermit? Look for a claw in the shell. I am certainly open to persuasion on this one, although it isn’t quite on my shortlist. Paul – Obviously the judges agree, but I’m sticking with my view on this, still my favourite so far. This sounds great. My kind of book. Ransmayr would be a great “catch up” project. I loved “Die letzte Welt” when it came out in English, but that was almost thirty years ago. I’m a great fan of Ransmayr: The Last World is one of my favorite books. I had no idea he had a new book out, and am not at all sure it will be available in the U.S., but I’ll keep my eye out for it.